The five story pagoda in the Shitenno-ji temple in Osaka, Japan. Shitenno-ji temple in Osaka, Japan was the first Buddhist temple in Japan. Shitenno-ji temple was originally built in 593 by Prince Regent Shotoku Taishi. In 587, when he was only 14 years old, together with his father-in-law, Soga no Umako, head of the most powerful clan Soga, fought against Mononobe no Moriya, head of the Mononobe clan, who was against the introduction of Buddhism into Japan. The prince prayed for help to the Shitenno (Four Buddhist Heavenly Guardian Kings) and promised them to build a Imperial Temple in their honor if the Shitenno helped him to defeat the enemies. His army became victorious thus he constructed a temple and named it Shitenno-ji (the Temple of the Four Heavenly Buddhist Guardians). This image belongs to the travel and nature stock photo library. 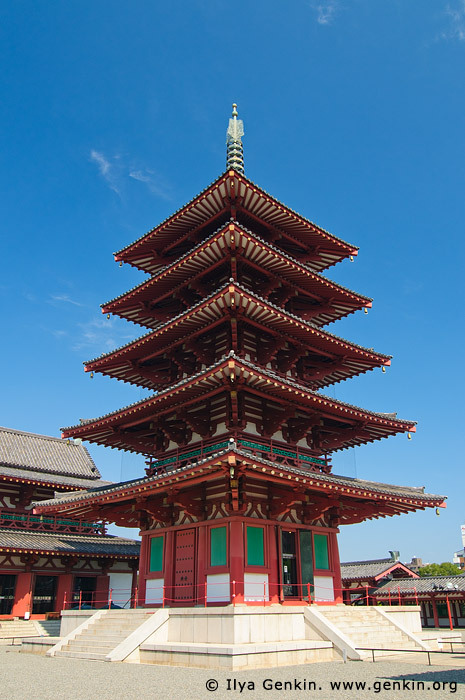 This stock photo of Five Story Pagoda in Shitenno-ji Temple is available for licensing for commercial and editorial uses including websites, blogs, books, magazines, brochures and advertising. Restrictions may apply for images which contain third party copyrighted material or sensitive subjects. Photos of artwork are for editorial use only. This image id JP-OSAKA-0016 of Five Story Pagoda in Shitenno-ji Temple, is copyrighted © by Ilya Genkin. This is not a public domain image.